SBI’s new generation of extracellular vesicle (EV) labeling reagents take your EV visualization to new levels of clarity, with low background and high selectivity. Unlike general-purpose labeling reagents that are not optimized for EVs and suffer from high levels of background signal, ExoGlow™-RNA improves your ability to track and localize EVs by specifically labeling EV mRNAs with a proprietary fluorescent dye that delivers very low levels of background signal. The result is unmatched EV imaging for more accurate EV studies (see below for our full range of next generation ExoGlow reagents). Figure 1. ExoGlow-RNA enables clear visualization of labeled EVs being internalized by target cells. 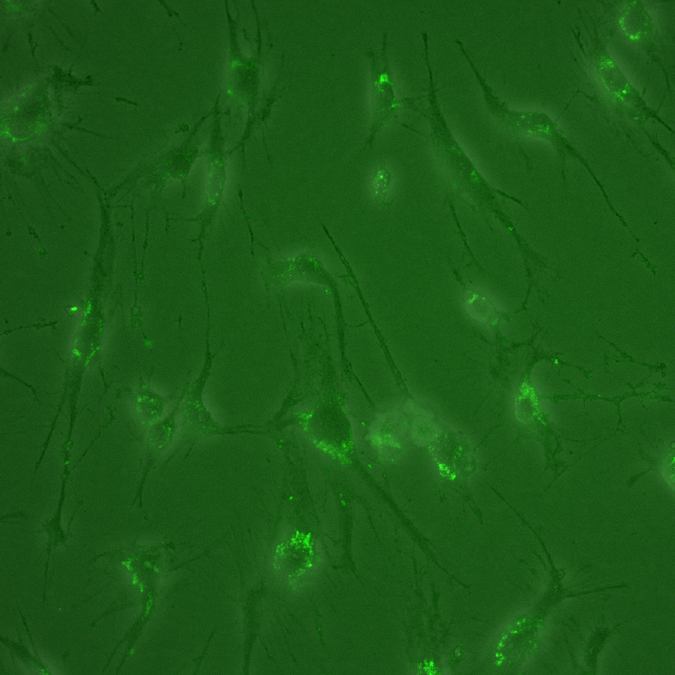 We labeled HEK293T EVs with ExoGlow-RNA and followed uptake by HEK293T cells. The fluorescence signal localizes to perinuclear and cytoplasmic regions, as would be expected for mRNA. Figure 2. ExoGlow-RNA specifically labels mRNA. We used ExoGlow-RNA to label total RNA isolated from HEK293T cells, and then specifically depleted mRNA using polyT magnetic beads. The almost complete loss of signal in the mRNA-depleted sample demonstrates the specificity of ExoGlow-RNA dye for mRNA.